After a long dry spell in which nearly every new fragrance I smelled was either boring or just plain awful, late spring / early summer 2013 is turning out to be a good time for perfume, at least for me — there are so many winners it's hard to decide which to review next. I just about drew straws to come up with today's subject, Black, from Comme des Garçons. I'm especially thrilled about Black because Comme des Garçons is likewise a brand with which I have gone through a long dry spell. As a new perfumista they were one of my favorites, but I've been less than enthused about the last few years' offerings. Black is a return to form of sorts — it's satisfyingly weird, and some people may find it less than suitable as a personal fragrance. And I cannot claim it is new territory for Comme des Garçons, quite the opposite: it's a woody incense, a theme they've explored in great detail already, and yes, as I expected, it's at least a little related to the Black Play fragrance they did last year, in fact, I'll start by saying that if you find Black to be just too much, try Black Play — it could be the Eau Légère / office-friendly flanker or something. Comme des Garçons is calling Black "an emergency, guerrilla like, spiced-up new scent" — language I found disconcertingly reminiscent to the not-so-exciting Guerilla fragrances they did back in 2006. Here, the claim is easier to justify. Black starts off with a highly aromatic whoosh of peppery incense and birch tar (the notes: black pepper, incense, leather, licorice, birch tar, pepper wood, cedarwood and vetiver). It's smoky and strong, with vague echoes of charred meat, and it's probably not something you'd like to encounter freshly applied on an elevator on a hot day in August. As it dries down, sheer spices and a touch of licorice add to the foody aspect, but it also gets softer, less insistent, and the incense calms to something a little less like Sunday Mass. The leather is soft as leather can be, and the licorice, while not heavy, is somewhat more noticeable in the later stages after the incense and pepper settle. It's more dry than sweet, and probably more masculine than feminine. After about 20 minutes, it's reasonably wearable, but still spicy and earthy enough to be interesting. If Black is too tame for you, do try Olivier Durbano Black Tourmaline; someone reviewing Black at Luckyscent pointed out, quite correctly, that Black could be Black Tourmaline's "polite little brother". Verdict: great fun, thank you Comme des Garçons. It's not going on my buy list, as I own enough incense to last me through several lifetimes and then some, but I'm awfully glad to have tried it, and I'd love to know who the perfumer was — if you know, do comment! 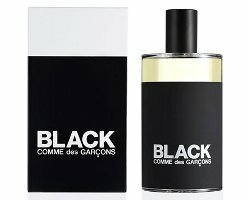 Black Comme des Garçons is available in 100 ml Eau de Toilette, $100. For buying information, see the listing for Comme des Garçons under Perfume Houses. Update: Black was developed by perfumer Guillaume Flavigny. This sounds like everything I wanted from a Annick Mendaro fragrance but never got. Really, not even Bvlgari Black or the Guerlain Armenie? Although admittedly neither are as bold as this. You could say I take my tar, incense and licorice Black. You could say that, but you would be committing some sort of pun offense. A pun-ishable offense. Well, do try it, and I’d say try Black Tourmaline too — it doesn’t have the licorice, but it’s a very cool scent. Ah. I love a punny joke. Have you tried Le Labo’s Patchouli 24? That’s Menardo letting her freak flag fly, and it’s brilliant. Part campfire, part black tea, part vanilla candle, part burning rubber. Even that one subdues in the drydown, but it remains weird, not comfortingly staid like Menardo’s more mass-market scents. Agree, great scent! I think of it as the Intense version of Bvlgari Black. @Subhuman I remember Patchouli 24 like most Le Labos wearing too sweet on me – I guess I do like my tar and styrax straight up. What’s wrong with me? – but maybe I’m do for a retry – some of my current loves are things that I initially wrote off. I’ll have luckyscent throw in a sample next time I order from them, thx for the recommendation. It does sound very Annick Menardo-y. Interesting. You guys must be right, but I wouldn’t have thought of it. Would love to know who did it. I really need to try this. Great review Robin. Hey, surprised you haven’t already, you’re usually ahead of me. I’ll definitely have to try this as I was disappointed by Black Play last year. It seemed so watered down, like they had a great idea for a composition but then panicked and diluted it. If this is the ‘intense’ version I am all for it! Great review, thanks Robin. I’m missing something: Daphne Guiness is the only CdG that I own and appreciate ONLY because I don’t know where to start. I need some advice. Please anyone what should I try? I am looking forward to trying more Tauers too this year. Any advice would be so appreciated. I think Le Maroc Pour Elle is divine by Tauer. It’s a perfect fume for me for anytime. Maybe try the original Comme des Garcons Eau de Parfum (this one — https://nstperfume.com/2007/02/08/comme-des-garcons-eau-de-parfum-original-fragrance-review/) and then the Incense series (5 fragrances, 2002). Hopefully others will chime in — it’s really hard to know which are “must smells”. I would suggest not to skip Odeur 53. You may like it or not, but it is special and very CdG. Oooh!!!! So exciting to hear that you’re finding many new fragrances to love!!!! Anxious to hear about the others. I would include in that set both of the recent Le Labos, and the new Hermes Mandarine Ambree (maybe good not totally great). Really, for me to even find 3 scents I like in one month these days is pretty darned good, but more to come that I’ll review soon. Cool! Haven’t tried any of these. In fact, I haven’t tried any Le Labos! So many perfumes, so little time! Guess I should check them out. And I’m a JCE fangirl. Love his style and approach to fragrance, though I can say I don’t really care for Jour d’Hermes. Nice, just not my favorite genre (fresh florals). I do like Jour d’Hermes, but it isn’t my favorite JCE either. Oh my sample of this arrived this week. I have only tried it once but wow it takes me straight to the scent memory of burning off with my dad on our property in preparation for bushfire season. Smoldering Eucalyptus tree trunks and burnt spicy native grasses and the indescribable smell when you wet it down afterwards to make sure you don’t actually inadvertently start a fire…. Beautiful smells. I’m looking forward to wearing it again. Oh, what a great scent memory to have! Now I want a smoldering eucalyptus scent in particular…I do love the smell of eucalyptus. Terrific review, Robin — will have to snag a sample in my next STC/TPC order. I’m so glad to hear that this one has some weirdness about it. The last time I went out for some serious sniffing, I came away feeling kind of underwhelmed, even though I’d smelled some well-regarded niche stuff that had been praised for being unusual, interesting, etc. While many of the fragrances were beautiful, there was a kind of same-ness about them. Not sure whether this was intrinsic to the perfumes, or whether it takes more weirdness for a perfume to make an impression on me now. Anyway, looking forward to trying this one. I think that is another wrinkle…that eventually, the ante has been moved so high that it takes some extreme oddity to make an impression. On the other hand, I liked the weird ones even very early on. Great review. Robin…and thus was born a sample lemming (petit lemming?). I think I smelled this at Aedes a few weeks ago but by the time I got to it, my nose was fatigued and the opening was so strong that it went into the meh category. I’ll need to revisit. Birch tar is actually one of my favorite notes…Andy Tauer’s Dark Passage, SL Boxeuses, ELDO Tom of Finland, among others. It is hard in Aedes, no? So much to do, so little arm space & nose time. Hope you’ll get to try it again. Skin, nose and even the store is pretty small. Between me and my tote bag plus maybe 4 other people, the store looked full! Oh I forgot to ask if anyone loves the Aedes signature the one with rhubarb? Loves? CdG Black is everything I have wished for in other perfumes labelled “Black”. I fell in love instantly but haven’t succumbed to buying a bottle yet. This is what we want from CdG, no more playing it safe please. From the description I can;t wait for this one to land somewhere near me. Yes, we get plenty of safe elsewhere, right? Robin, I’m intrigued by your incense collection in which you have enough to last a lifetime :). Could you tell me your top favorites? This does sound wonderfully weird, and I do want to sample it. Ingot sick of Bulgari Black, my last weird frag, after a while and swapped it off, but I’m really liking the idea of birch tar in this Black! I am wearing Aftelier Ancient Resins a lot this year. Also love the older CdG incenses, esp. Avignon & Kyoto & Ouarzazate (esp the latter, but all of them), & still adore L’Artisan Passage d’Enfer. And will put in kind words for Sonoma Scent Studio Incense Pure & Andy Tauer’s Incense Extreme, and the first Aedes scent, and Amouage Jubilation XXV, and my old favorite Etro Shaal Nur for a beautiful spring / summer incense. Thank you, Robin! Passage d’Enfer is one of my favorites as well, in addition to the CdG incenses. I’ve never tried the Aftelier, so that will be on my most wanted list now. Thanks for all of the suggestions! Hey Robin. I need to spend more time with Black — maybe get a small decant — as I’ve only sampled it on skin in a store. I enjoyed it, but I still felt like I *loved* Black Play so much more. The latter seems more spicy or something. Still, I think both were well done scents, reflecting the CdG aesthetic well. I’m still a fan of the house. Joe, I’m still a fan too! And still have tons of their scents on my wish/buy list — still don’t own Hinoki or Laurel or the fabulous Stephen Jones, all of which are just great scents that cost a bit too much. This one is more reasonably priced, so I’ll give it props for that too. Black Play is a great scent, I’d wear it if I had it, that’s for sure. Thanks for the review! Does this in any way resemble Diptyque’s John Galliano scent (candle/roomspray) if you know that one? The Diptyque is considerably softer due to the iris and vanilla. Always wished they’d do that one as a personal fragrance, it’s a great scent.